What is α-synuclein when it’s not aggregated? You are here: Home / Biochemistry / What is α-synuclein when it’s not aggregated? In a recent paper in PNAS, co-lead authors Wei Wang (Indiana U. School of Medicine) and Iva Perovic (Chemistry Ph. D. program, Brandeis), together with researchers from Brandeis, Indiana, Scripps, NIH, Washington State, and Harvard, investigated the structure of the abundant small neuronal protein α-synuclein. α-Synuclein has been strongly associated with the disease process in Parkinson disease, both from histology (found in aggregates in Lewy bodies associated with disease) and from genetics (mutations in the gene associated with a rare familial form of Parkinson disease). 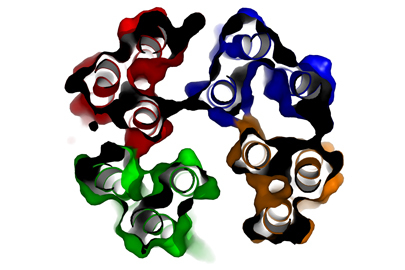 The structure and function of α-synuclein is not well understood. It is an abundant neuronal protein, and appears to bind to lipids, vesicles, and plasma membrane. Heterologously expressed α-synuclein is often observed to be unfolded, and the biochemical role of the protein is still unidentified. In this new study, α-synuclein was expressed as a GST fusion protein in E. coli and proteolytically cleaved to form α-synuclein with a 10 amino acid N-terminal extension. This protein was shown to form a stable tetrameter with alpha-helical content in the absence of lipids, using a combination of many techniques, including NMR spectroscopy, electron microscopy, circular dichroism and mass spectroscopy of cross-linked products. The authors combined this information to propose a model for the structure of native α-synuclein when it is not aggregated that is a tetramer based on amphipathic central helices. Researchers in the Pochapsky, Petsko-Ringe and Agar labs at Brandeis participated in the study. Future work is aimed at understanding the function of this tetrameric form of the protein, with the hope of developing techniques to stabilize it and determine its function. For more information and interview with the authors, see the story at BrandeisNOW.